The Florida Renaissance Festival is on now through March 14th in Deerfield Beach, FL. Visit the 18th Annual Renaissance Festival and the beautiful South Florida weather! Travel back to the 16th Century, enjoy the sights, sounds, and smells of The Renaissance, shop crafts, wear period costumes, play games! Check the Florida Renaissance Festival website each week to see what the theme of the week is! This week is pirate week! Dress in your best pirate costumes and win prizes! Maid Marian, Princess Bride, and more. Tavern Wench, Peasant Lady, and more. Merlin, Lancelot, Robin Hood, Inn Keeper, and more. Tavern Wench, Medieval Knight and more. Lady Windsor, Lord Windsor, and more. Little John, Merchant Lady, and more. King Arthur, Armor Suits, and more. Crusader, King Arthur, Renaissance Knight, and more. King Wizard, Tavern Lady, and more. King Arthur, Juliet, and more. Crowns for men, women, and children. Gold, Silver, and Black Rhinestone Tiaras. Today on the Rachael Ray Show was "Tips Day" a day of all kinds of tips from viewers and experts on everything from food & cooking, to health, to beauty even how to keep ants out of your house! From Mally: Combat tired eyes by using a shimmering silver or pink shadow on the inside points of your eyes and where the socket meets your nose. Using concealer to cover under eye darkness is well known, but women often overlook this inner area. From Gretta: For longer lasting lipstick, after brushing on your favorite lip color, set it with the same color blush! Use the same or similar color and a large brush to brush on just a bit of blush to set the color, then apply your lip gloss over that. It will make your lipstick have lasting color and lasting power! From Mally: Make your natural hair makeup brushes last a lifetime! You should be cleaning your makeup brushes at least once per month if not every other week using baby shampoo. 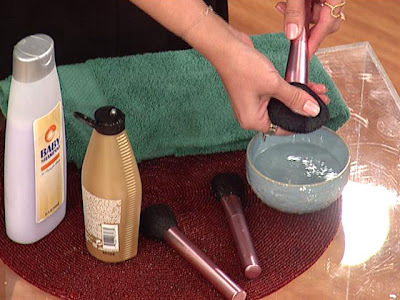 But you can also condition your natural hair makeup brushes with your favorite hair conditioner. Just put a dab of condition on the brush, rub it in and rinse in a dish of water. Also, do not put your brushes tip side up in a cup to dry, lay them on a towel with the handle side up higher so that the water will drain off rather than go into the base of the brush and loosen the glue. From Gretta: How to keep your eye shadow on long with out fading! Use lip balm on your eyes before brushing on your eye shadow. The eye shadow will stay in place and will not lose color! From Mally: Tip for eyebrow pencils: your eyebrow pencil color should be a shade lighter than your actual eye brow hair color. This applies to all hair colors except silver or very fair blonde. From Gretta: Beauty tip for dry hair and dry scalp: add a few drops of tea tree oil to your favorite shampoo! StageAndTheaterMakeup.com features Ben Nye, Mehron and Bloody Mary makeup for every day, not just for the stage and theater. These professional brand makeups are made to last longer and show brighter, so they are perfect for your every day makeup look and these great makeup tips apply as well. Universal Studios in Orlando is celebrating its 15th year of celebrating Mardi Gras in their theme park in Orlando, FL. Starting today, February 6, 2010 and running through April 17, 2010, you can see the daily Mardi Gras parade with tremendous floats, decorated in Mardi Gras' traditional colors of purple, green & gold, plus fabulous performers entertaining the crowds in elaborate Mardi Gras costumes & throwing beads and coins, a Mardi Gras tradition. Universal Orlando also features great bands for Mardi Gras with great bands such as K.C. and the Sunshine Band, Heart & Kool & the Gang performing live on the Mardi Gras concert stage! There are great ticket deals for both Florida residents and guests from around the world. Don't miss this great Mardi Gras celebration in warm & sunny Florida! See Universal Studios Orlando web site for more details, concerts schedules, and to purchase your tickets today to get in on the Mardi Gras fun! And to have your own Mardi Gras fun at home or wherever the party takes you this Mardi Gras, visit MardiGrasCostumes.com for costumes, hats, beads, coins, masks and more. Purim is a Jewish holiday. This year, Purim is on February 27, 2010. On Purim, children, and some adventurous adults, too, traditionally masquerade—an allusion to G‑d's hand in the Purim miracle, which was disguised by natural events. Make sure your children dress up as good, cheerful characters, such as Mordechai and Esther. Please visit our affiliate sponsor! Kosher.com for Kosher meats, groceries & yummy bakery items!